AliatePress 1.0.3 is now available! This update release introduces some fixes and enhancements, including new feature Bulk Import by Product ID and Plugin Updater. 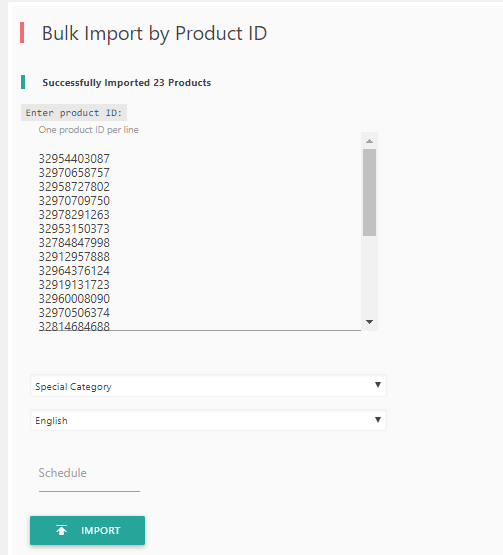 Now you can import Bulk Aliexpress product by product ID, this is an alternative due frequent Aliexpress Search Product API issue. Please note, not all Aliexpress product listed in Aliexpress.com join Affiliate Program, so if you import 1000 Product ID, there might be some product not be imported. We will make video tutorial how to scrape thousand Aliexpress product id easily soon, stay tuned! Since this version, you can update the plugin via WordPress Installed plugins section. Added Buy Button Open in New tab option in settings. Thanks to everyone for all your great feedback and suggestions. Keep it coming!. If you find a bug or an issue, then tell us about it. Remember to mention specifically what the problem is and where it happens.